Click the picture for a map to the Library in Ballard. Click the picture for parking information and street views of the building in Ballard. We welcome the participation of new members and volunteers to help build a useful and valued community resource! Alchemy was a lifelong interest of Jung's, one of the first metaphysical topics that influenced his turn toward the spiritual nature of psychology. 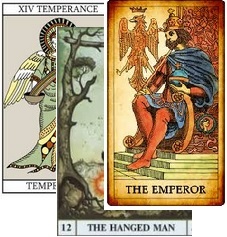 In our class, we'll follow the alchemical process of transmutation through the levels of The Journey of the Fool in Tarot's Major Arcana, illuminating the seven concepts of soul development that lead to the purity of the Lapis Philosophorum, the Philosopher's Stone, the symbol of Jungian individuation. Parking: If you are driving by car, give yourself about 15 minutes to gind a parking place - the Ballard Farmers Market is happening at the same time, and takes up a of parking. You can contact Kathy directly at kathy (at) seattlemetaphysicallibrary (dot) org or (206) 595-1661 if you have questions about the class or would like to be on her mailing list. This difficult-to-find video looks at one of the seminal events in the war on American freedom, the bombing of the Oklahoma City Murrah building, and the sinister activities that lead us to question if McVay was just another patsy in a sophisticated government plot to further destabilize our country. ATTENTION ALL TESLA WORSHIPPERS, FREE-ENERGY BUFFS, "CRAZY" INVENTORS, ANOMALY HUNTERS, SCALAR RESEARCHERS, ANTIGRAVITATIONALISTS, AND O/U-NITARIANS! Meetings of Seattle's "weird sciences group" will take place the first Friday of each month and yes, the general public is very welcome to attend.